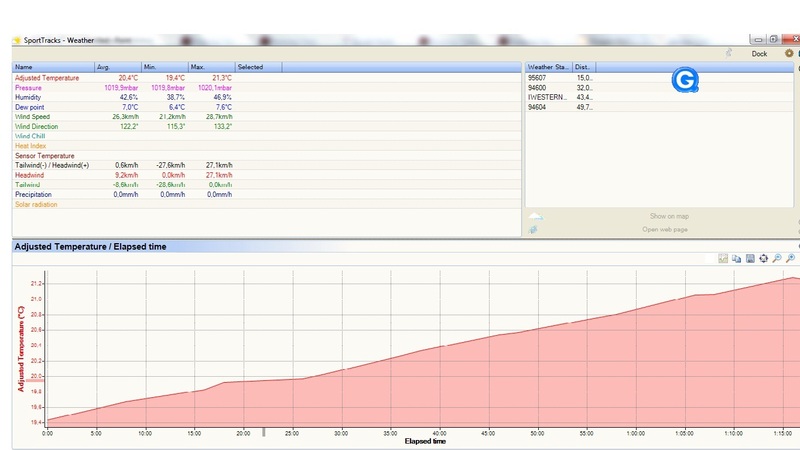 for the first time, I tried to take advantage of the "Training Load" function of the SportTracks3 SW. The greenish line (Training Stress Balance) was so still well below “0” very close to the marathon and I really had to take 3-4 days very easy to get a decent taper and reach race day with a TSB of +8. I think that probably is better to avoid getting so close to a “A” race with tough workout and get more freshness to really have the best performance. If someone is interested in knowing more about how to use the function, just pop me a message. Difficult to say something on this. The first 10k are uphill, so the pace was fair. From 20 to 35 it is mainly downhill and also we really started to pick up the pace. The split from 35 to 40 is great, considering the climb out of the tunnel and all the other flyovers, etc…Than I was really done for the day and just keeping the pace. All the race was done following the indication of the Polar… I did on purpose hold back until the 20Km at the lower end of the MP zone… then it was time to start the race..
and lastly, the newspaper also find the goodwill to make an article about “the race in the race” for the local runners, where I am also interviewed !! 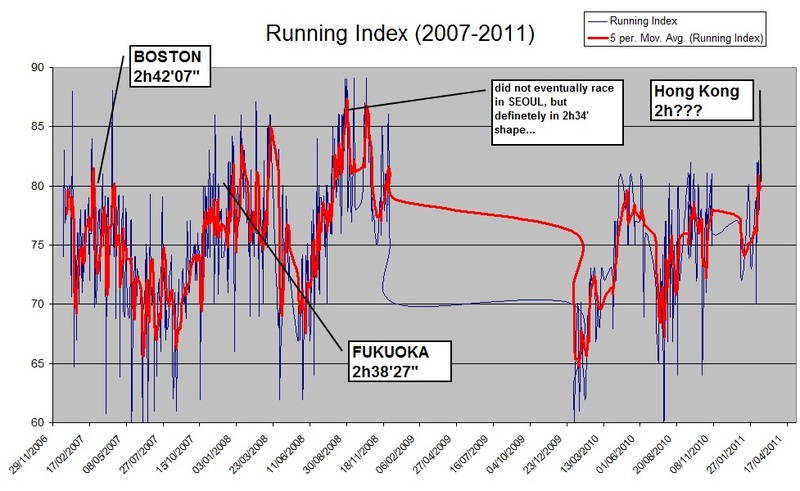 for me, the greatest satisfaction is to being able to run in Fukuoka again.. with 2h39' I am sure to make their entry requirements. Now you know where I will spend my first Sunday of December ! So I eventually did my debut in our local marathon…. 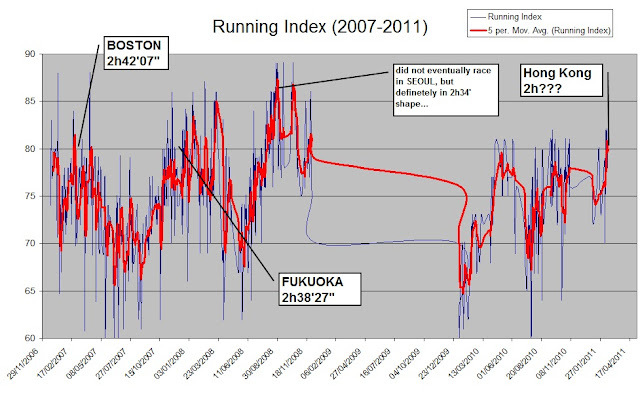 It is difficult to decide where to start from, if from an aseptic narration of the race or from the deep emotions that every marathon leaves in a runner…. So I start from the 32K mark…. Until that moment, I had run the whole race shoulder to shoulder with Wioleta Kryza (a Polish Pro woman … after the race a google search revealed that in 2002 she was suspended for doping…). In few words she told me that she was quitting there because she was out of the money prizes. I was alone with 10k to go and I could only see maybe 400m ahead 2 local runners who were directly competing for me for the “local runner special classification”. so go for it (sub 2h40’ and 3rd place) or just cruise to the finish and be content with 2h41’ and a 5th place? I felt my body refusing the idea of pushing even harder, but my mind was really focused and little by little the 2 got read and blue spots ahead got bigger and bigger. Last turn, I see the finish line with the clock ticking away 2h39’30”…40”…45”…but is done…I crossed the line in 2h39”52”, around 15-20th overall but most important 3rd local runner…. The gratification was also “material” when I realized that I won 1500USD for the 3rd place in the special classification for local runners… the first time I ever win a cent running. My HR rate soared to 175-180bpm and I had to control my breathing, resume running and wait for the next water stop to sponge my bleedings.. The race was not compromised, I got back gradually to my “pacemaker” and we reached the half marathon mark in 1h20’50”. Anyway it seems that the past figures give a good idea of how my performance could be. obviously these are my personal data and other people might have different curves. So I can bet on myself for Sunday that the time probably it can be something around/above 2h40', but then need to be factored by the hilly course and weather conditions (humid...). A guy put a camera on a car and did all the course of the HK Marathon. It is impressing from 4'45" onward to appreciate the gradient of the big Stonecutters bridge... is really steep and long. What the heck was I doing there ?? Well, during the CNY holidays, we went there for a family beach vacation and the usual round of country parks, etc.... (at least my kids would understand what a cow looks like...). Basically it was totally unplanned and one day going around town we noticed a banner advertising a half marathon for the saturday.... so, why not ?? it was really windy, with serious headwind on half of the course (heheh... tailwind on the other half...). To get good data for my assault to the marathon, I run in full "data crazy" asset: Garmin, HR strap and foot pod. The target was to run around 3'40" which seemed a reasonable pace for such a windy day. Also I wanted to keep the HR as close as possible to 170bpm in first half race, to leave space for climbing up to 177-180 only on a later stage. In this way, it was a fairly reasonable effort, but not a real "half marathon" full out (where I should start at 175bpm and later see the HR drift to 180-180bpm or even more...). Anyway, right after the start, it was quick to realize that there were 2 runners much faster than the others and they soon disappeared on the horizon. I was quite comfortable in the 2nd pack and it was good to see that my HR was just around 170bpm as I wished (85% of my max). 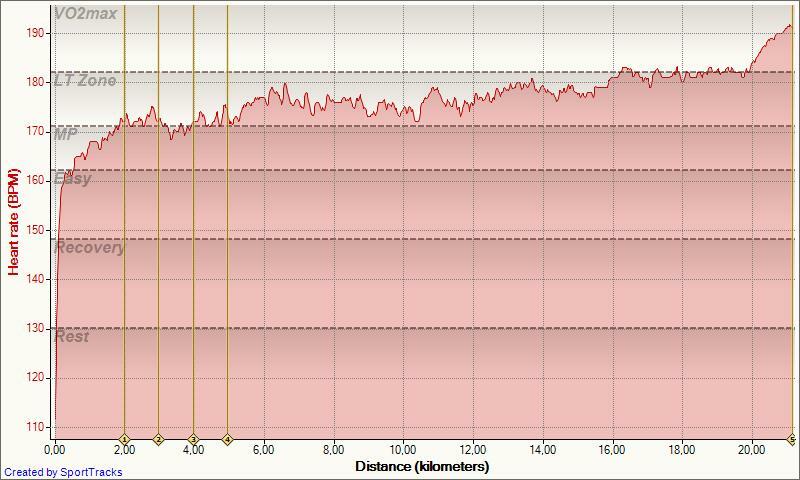 As you can see, I kept a very steady effort (and 3'40" pace) until 16km, where the last headwind section required me to work harder to keep the pace. Progressively our pack was losing pieces and we were left in 2 with 5km to go to dispute the 3rd place. So, final result: 3rd overall, 1st Master in a 1h17'46" which was right on spot of my targeted pace.